It’s almost time for Spring Break! You hope to plan an experience for your family that will be fun and enjoyable for everyone. Perhaps you are unsure how your sensory kid will react in a new environment, especially when “kid friendly” places have so many unpredictable sensory experiences including new things to see, textures to feel, sounds to interpret, and movements to tolerate. Many children with Sensory Processing Disorder benefit from knowing what to expect in advance and having small sensory experiences before they are exposed to it fully. This can decrease the amount of emotional anxiety connected to the unknown and small exposures to new sensory experiences prepare their body to know what to expect. 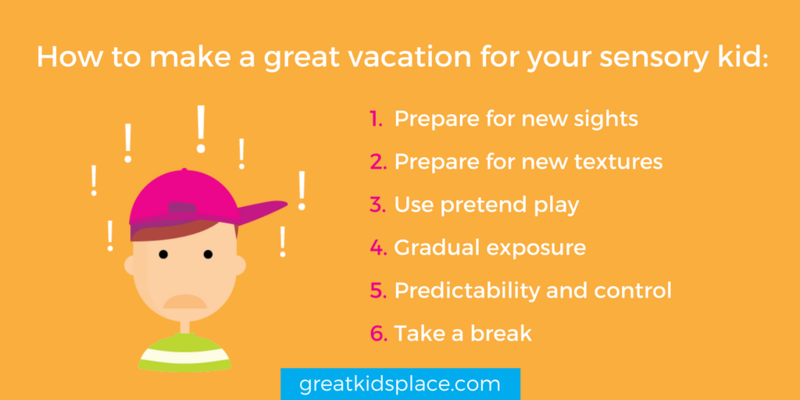 Regardless of where you plan your trip, preparing your child can lead to a more enjoyable time for everyone! Here are some fun and easy ways to get your sensory kid, and your whole family, ready for your time away from home. Start off by showing your child pictures of where you plan to go. If you plan to go to an amusement park or a water park, check out their website with your child and show him pictures of what he might see…. particularly the kid rides! This is a nice way to start a conversation about what to expect. Think together about which rides he may enjoy. Wonder together about what the ride may feel like- fast, wobbly, slow, or sturdy? Talk about how it may feel similar to an experience or ride that he has tried before. Will your trip involve wearing new clothing or clothing only worn a few times a year? A beach or water park trip involves new textures including bathing suits, arm floats, goggles, and more! Try these on in advance so your child can acclimate to the sensation of wearing these textures and know what to expect when it’s time to swim or do your planned activity. Make a new sensory experience one to look forward to by using pretend play! If heading to the water park, create a pretend water park in your home. Try pretending that a towel or laundry basket on the floor is a float and use it to “float in the water” or “float down the river”. Try putting a cutting board on the floor and pretend it’s the edge of the pool or a diving board… then jump onto the floor or a blanket where you can “swim” around. Use pretend play to simulate an activity/ride that you think he may enjoy at the water park or one that you picked out together when looking through the pictures on the website. Take it one step further and let them wear their swim gear during the pretend game to make it even more real! Let the play imitate the sequence of steps that will happen the day of your trip as another way of preparing your child for what to expect. For example, first put on the swim gear, then spread out the towel, look for the ride, wait on the line, then have fun! Or, if you know what will happen on the ride, make that part of the play sequence too. First, walk carefully into the water, climb onto the float, hold the handles, then float down the lazy river. When you arrive at your destination, walk around during a time when less people are around so your child can get a “lay of the land” and see what the activities look like before it’s time to go swim or it’s time to try them. Whether your sensory kid is preparing for a ride at the water park or any type of movement experience, encourage movement that’s a slow and predictable speed or one that your child can control. Keep this in mind when picking out the rides your child would like to try. If the area is very noisy, this can make new sensory experiences even more overwhelming. Take periodic breaks in an area that’s quiet and less busy. Preparing your sensory kid for a spring break trip, or any trip away from home, is a wonderful step towards making it more fun and enjoyable for the whole family. Gradual exposure, including pretend play, helps your child prepare for a new sensory experience while he is still in the “safety zone” of home. Help by providing predictability, control, and breaks as needed so your child can have the “just right” amount of sensory input, making a successful trip for all! Elizabeth Rice is an occupational therapist at Great Kids Place. She is a specialist in Sensory Processing Disorder (SPD) and social-emotional development. Liz has advanced training and certification from the Sensory Treatment And Research (STAR) Institute, developed by Dr. Lucy Jane Miller, OTR. She is DIR/Floortime certified in social-emotional development through the Profectum Foundation. Liz is Interactive Metronome certified and trained in the use of Listening Programs including the Safe and Sound Protocol.